There are a lot of ways that artists work together, but one of the most complicated, and sometimes one of the most rewarding, is being in a band. Everybody in the band has their own vision, their own creative ideas, and their own complicated complications, and bringing that all together is always a work in progress, especially since ‘together’ means right down to the sixteenth note, all night long. Johnny Nevin: How was the D Hangout Show? Dank Wellington: The show was good; after dressing the stage and returning home to take care of some last minute preparations, we returned to find an intrigued and enthusiastic audience. We performed an array of newly added material along with some past favorites that have become indicative of a Lunar Chiefs performance. Our philosophy as a three piece band is that the limitations of the smaller arrangement offer an open canvas to make songs our own. It demands more involved musicianship and creative solutions to make big songs sound big. Johnny: Lunar Chiefs is a three piece, and yet a lot of your current sets are big arrangement classic tracks, often some pretty deep cuts. What’s your approach to bringing these songs into live guitar – bass – drum arrangements? Dank Wellington: Our philosophy as a three piece band is that the limitations of the smaller arrangement offer an open canvas to make songs our own. It demands more involved musicianship and creative solutions to make big songs sound big. 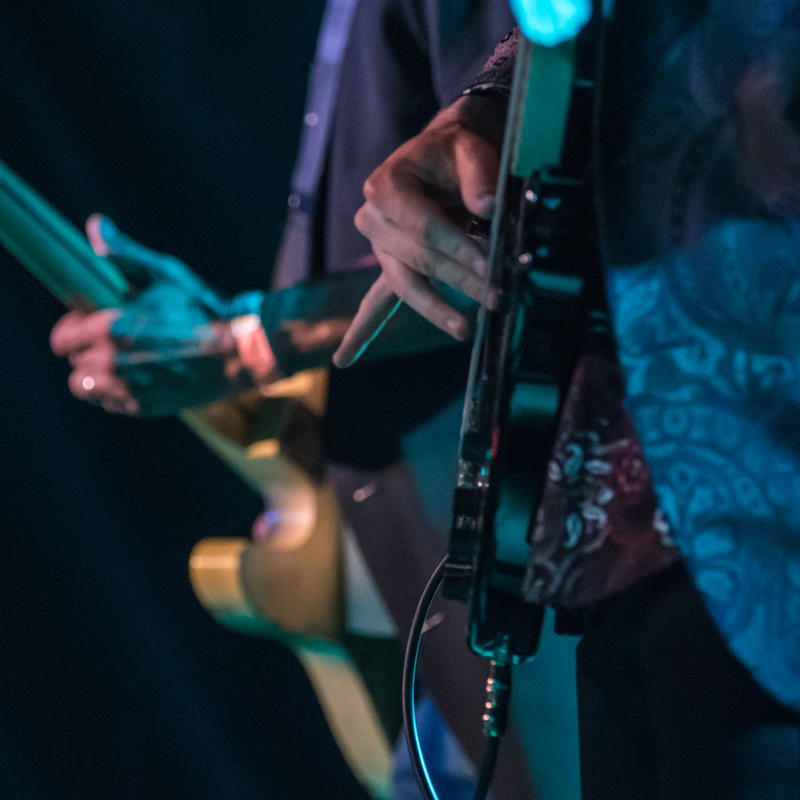 We all push ourselves to use our instruments as extensively as possible; we are all multi instrumentalists, bring in songs we can make shine, and–while our guitarist is typically the front-man–we all sing. When covering a song, we listen to it over and over again; breaking it apart into its elements. We then try to replicate parts by processing our sound and deviating from the original compositions. Since we don’t have a brass section or a sole piano player, for example, we have to imitate those instruments with effects processors and emphatic playing on songs like “Low Spark of High Heeled Boys”. Our guitarist stretches what sounds his instrument can do with an effects processor, a whammy pedal, EQ, and a bi-amp system. In other songs, like Learning to Fly, the bass parts pick up the slack that would normally be filled by a rhythm guitar. We also involve the use of two keyboards and drum sequencers–operated by the bassist and drummer–for songs where the keys are vital to the composition. I personally run my keyboard with a volume reversed sustain and volume pedals to set pads, play bass over them, and bring them in and out. I also use a looper pedal loaded with mixes of CC0 sound effects to recreate signature parts of songs, like the rocket launch in our rendition of Space Oddity. We’re always looking to add more to our sound, and I think that looped tracks, MIDI devices and new software will be a part of that growth in the future. We formed Lunar Chiefs with the vision of a full concert that that can be packed up and brought anywhere. We believe that a band should entertain, and a big part of that is stagecraft. Johnny: Since you guys started just a couple of years ago, you’ve put a lot of emphasis on the visuals for your show. What is the idea behind what you’re doing in terms of your emphasis on visuals? Dank Wellington: We formed Lunar Chiefs with the vision of a full concert that that can be packed up and brought anywhere. We believe that a band should entertain, and a big part of that is stagecraft. Whether it’s setting up backdrops, rigging lights or developing costumes, the look of a band is just as important to their entertainment value as the music; they go hand and hand. I couldn’t imagine performing our rendition of Goodbye Horses without wearing that quirky horse mask or rocking Shine On You Crazy Diamond without fog and lasers to set the mood. I’ve seen tons of bands that were good players, but it looked like they just plopped their equipment on stage and started playing in their street clothes. We want to break away from that mindset and create an act that is both a production and a happening. We strive to improve our show for every new performance. It doesn’t even limit itself to visuals; we want to incorporate all five senses into the Lunar Chiefs experience. Beyond the music and light show, we incorporate essential oil diffusers with our unique blend to change mood with aromatherapy, pass out promotional items like show programs and buttons, and even have eye catching unicorn-lady tip jar/button dispenser that fans can interact with. As for taste, a signature drink recipe may be in the works. Johnny: With the emphasis on developing the live show, what’s your guys’ plans in terms of originals? Is there a release in the works? Dank Wellington: We have been so occupied with developing our live show that our original music has been put on the back burner. Most of our rehearsals have been chasing the development of new material to keep the act fresh and growing. We have many moments of spontaneous original music and an extensive library of original material ready to be arranged into full songs but, as of yet, our focus is on perfecting our live shows. We do plan to put out an LP with a mix of original music and covers that we have really made our own, namely Sideways and likely Spooky. Johnny: Can you tell us about the benefit that you’re playing on October 8th, Midwest Musicians Unite for Hurricane Relief? Dank Wellington: The benefit is taking place at The Original Sundance Saloon at 2061 W. Maple Ave, Mundelein, IL from 11:00 A.M. to 9:00 P.M. Proceeds go to victims of the recent hurricanes to hit the southeast. This all ages, family friendly event will feature “raffles, a 50/50, and live music from some of the best area musicians” (Midwest Musicians Unite for Hurricane Relief). Lunar Chiefs are Live at 12:00 and each of the 9 total bands will play 45 minute sets throughout the day. A recommended donation of $20 can be paid at the door to support the cause.